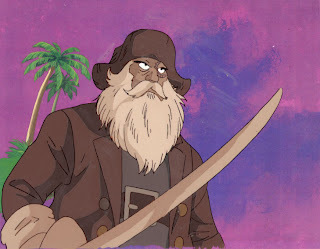 Yesterday was International Talk Like a Pirate Day. To (belatedly) commemorate the occasion, let's take a peek at a paranormal pirate 'investigated' by David Farrant. He reproduced an article covering the event from the Evening News, dated 'Wednesday 1, 1972'. While a month would've been helpful for citation purposes, we can pinpoint it to November, thanks to contemporary coverage of the case (e.g. 'Halloween ghost couple held', Daily Express, 1 November 1972, p. 13). Citations have never been Farrant's strong-point. However, far from detailing any supernatural activity, the press coverage concerns the arrest of Farrant and his assistant, Victoria Jervis (listed as 'Lucy Grant' in the Daily Express account) while conducting a summoning ritual in St. Mary's churchyard, Monken Hadley, Barnet. On Hallowe'en night, no less. The reproduced Evening News article describes Farrant's intent: 'Farrant, 33-year-old President [Farrant would have been 26 at the time, as he was born on 23 January 1946] of the British Psychic and Occult Society [his organisation was not called this until 1983. Farrant must have incorrectly transcribed the article], explained . . . "The ghost of Wallmsley the Pirate comes out twice a year - on Hallowe'en and Christmas Eve."' The source for this tale, was 'local stories'. The couple were charged with 'disfiguring a churchyard' ('Halloween ghost couple held'), which later articles would clarify as 'indecent behaviour under the Ecclesiastical Courts Jurisdiction Act of 1860' ('"Ghost watchers" fined for ritual in churchyard', The Guardian, 23 November 1972, p. 10). They were fined £10. The same article mentions the presence of a reporter, who, according to Farrant was only there to 'be a witness if the spirit appeared'. He also denied informing the press. If that's the case, he certainly chose a strange 'witness'. I have tried to put most of what happened out of my mind. The false letters I wrote to a local paper were to stimulate publicity for the accused. I saw him almost every weekend in the second half of 1972 and I went to Spain with him for a fortnight at the end of June that same year. I was arrested with him in Monken Hadley Churchyard. That incident upset me very much. Afterwards, my doctor prescribed tranquilisers for me. After noting that Jervis was 'visibly shaken' by this event, he went on to say, 'Her cousin had certainly come across a good story but, now, before the case had even come to court, the episode had found its way into the national press' (p. 71). The funny thing is, all these troubles could've been avoided if Farrant took the trouble to conduct an actual investigation, rather than trespassing on church property to conduct rituals in the dead of night. The 'mystery' of our ghostly pirate, Tom Wallmsley [sic], was unravelled by Jennie Lee Cobban. So lets begin at the beginning: in the latter part of 1995 a historian from Barnet started The Highgate Vampire Society. Her name was Jennie Lee-Cobham [sic]. She began the Society when she was researching material for a book (published in 1996) on ghosts in North London, including Highgate and the Barnet area. This was started mainly as an historical Society, but in 1997, the work-load got a bit too much for Jennie and she asked me if I would be interested in taking this over from her and running it as a ‘sister society’ to the British Psychic and Occult Society. I agreed, and kept the name and the membership she had gathered up to that point. In 1995, a lady called Jennie Lee Cobban was researching a book on the history of Barnet and Enfield, and had contacted myself. She was particularly interested in a case I was involved with at Monken Hadley churchyard, when I was arrested for 'summoning up a pirate's ghost' in the churchyard, in October 1972. She was also interested in the so-called Highgate 'vampire' case that had occurred in Highgate in the early 1970s. She had been commissioned to write a book on the history of Barnet and Enfield, and she also wanted to include the so-called Highgate Vampire case as well. For this purpose I was invited to her home in 1995, and learned that she had done a lot of research into the Highgate 'vampire' case. Because of all the interest, she had at that time formed a society, the Highgate Vampire Society, which she had set up to deal with the interest into this particular subject. Her book came out in 1997 [sic], and was titled 'Geofrrey de Mandeville and London's Camelot: Ghosts, Mysteries and the Occult in Barnet', and dealt with these aspects, as well as including a chapter on myself. As part of her research - as said - Jenny had already formed the Highgate Vampire Society, and because of domestic reasons she asked me if I would be willing to 'take this over'. I did so, using the name, and all of her initial membership. David may console himself with the knowledge that even had he managed to conduct his ceremony uninteruppted in 1972, he would still not have managed to raise the ghost of a pirate at Monken Hadley, because no pirate was ever buried there (p. 138). 'Coincidentally', Farrant does not mention these revelations in his subsequent books which cover the case. A classic example of 'mystery mongering'. Therefore, it's safe to assume the story's a bunch of arrrse. 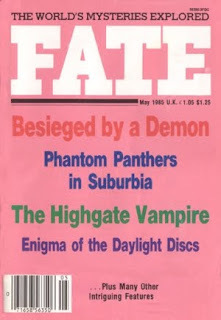 Edit (26 January 2012): Farrant actually does acknowledge the revelations in one of his publications, Rob Milne's Return of the vampire hunter: an exclusive interview with reclusive vampire hunter, David Farrant (London: British Psychic and Occult Society, 2003). Sort of: 'A ghostly pirate. Presumably the reason it was supposed to be the ghost of a pirate was because a very small 17th century gravestone known as the pirates [sic] grave, had a skull and crossbones on it and so people imagined that it was a pirate (p. 12). However, this revelation is obviously derived from Cobban, sans acknowledgement. After all, what was Farrant trying to summon, if he was aware of this 'urban legend's origins at the time? On Friday, I received a few issues of the Vampire Information Exchange (VIE) newsletter, VIEN, which discussed the Highgate vampire case. "Highgate - Fact or Fraud ?" I recognised the first article as something that'd also been reprinted in Fate (May 1985, pp. 74–80)*, which, in turn, was originally published in the Society for the Investigation of the Unexplained's journal, Pursuit, vol. 16, no. 3. VIEN adds that the article was originally printed in 1983. It also mentions that Thompson was a former VIE member. Hampstead and Highgate Express: Feb. 6, 13, 20, 27, March 6, 1970. London Times: Aug. 7, 30, 1970; June 11, 15; July 2, 13, 18, 1974. Occult, newsletter of the British Occult Society, Vol. 14, No. 11, March 13, 1981. Summers, Montague, The Vampire: His Kith and Kin, University Books. Sylvaine Super Star, privately published in France, ca. 1980. Her bibliography contains references to the Highgate Cemetery case. Underwood, Peter, The Vampire's Bedside Companion, Leslie Frewin, London, 1975. Some interesting stuff there. For starters, Occult, appears to be a precursor to The Cross and the Stake, the Vampire Research Society's newsletter, which, in turn, transmogrified into an online forum of the same name. The volume and issue number of Occult is quite daunting: it must be nearly impossible to score a single issue of the newsletter, little alone all the issues. Sylvaine Super Star is no doubt the work of French actress, Sylvaine Charlet, who Manchester captions 'a glamourous and invaluable ally' in the '85 edition of The Highgate vampire (1985, p. 100). According to the book, she also accompanied him on vampire vigils...and masquerade ball (pp. 118—20, 123—4). Thompson's article, itself, makes references to the MS which would later become The Highgate vampire (1985). I definitely recommend Thompson's article, but it might be easier and cheaper to score it from Fate. I, however, am gonna try and find the original Pursuit version, as I'm a stickler for first editions and such. Youngson's 'Highgate - fact or fraud?' (November 1984, pp. 19—20), on the other hand, appears to be an original article. She was the president of the Count Dracula Fan Club (now Vampire Empire). The article recounts a recent trip to Highgate Cemetery, in which she is taken on tour by a 'member-volunteer'. Naturally, she asks about the vampire, who mentions that such accounts are discredited by the cemetery's caretakers, the Friends of Highgate Cemetery. There's even a perfectly rational explanation for the mysterious dead foxes allegedly found in the cemetery—something neither Manchester nor Farrant seem to have mentioned in their writings. She is very critical of Farrant's behaviour at the cemetery, however, she mistakenly assumes he was responsible for a corpse being propped up in a car (someone else came forward during Farrant's 1974 trial, admitting to the crime). Lastly, she deals with the 'controversy' over the cemetery's setting for Bram Stoker's Dracula (1897). It is commonly assumed that vampiress, Lucy Westenra's tomb was located there. However, closer readings of Stoker's novel (which Youngson alludes to), have produced very different results. The issue, itself, is billed as a 'Highgate Cemetery Edition'. Apart from the remainder of Thompson and Youngson's article, it also includes reprints of articles from The Times (referred to as the London Times, due to the paper's American publication) and one from the National Examiner, 'Real-life vampires roam cemetery' (August, 1984). Despite the article's date, its content harkens back to Manchester's 'Highgate vampire' chapter for Underwood's The vampire's bedside companion (1975). So, can I recommend chasing up these issues? Apart from Youngson's original article, no, not really. If you want newspaper articles, you're better off finding the originals, especially with the advent of digital archives. Thompson's article is a goodie, but if you can get it elsewhere, why bother? Its not even the original printing. That's not to dismiss the VIEN altogether. After all, I've heard of some juicy stuff in the newsletter's sixth issue. Who knows, there might be more interesting tidbits buried there. But I think it's safe to say that you can give these ones a miss. * A Fate article I already had.